The co-op Waubonsie Valley hockey team returned to the ice from winter break on Jan. 3, with a 4-1 victory over Naperville Central. But then the team lost its next three games, falling to Glenbard, Wheaton West and Naperville North. “That was a look-in-the-mirror moment,” said Waubonsie first-year head coach Jeremy Dombro. Waubonsie regrouped with back to back wins: 5-3 over Maine on Jan. 19 and 5-2 over Neuqua the next night. They then lost 6-3 to Hinsdale Central on Jan. 21. Waubonsie was done losing at that point – for the rest of the season. “We picked the right time to get hot,” Dombro said. Waubonsie went 12-0 in the league and state playoffs, capturing both the Illinois West Championship and the Combined Division State Championship. 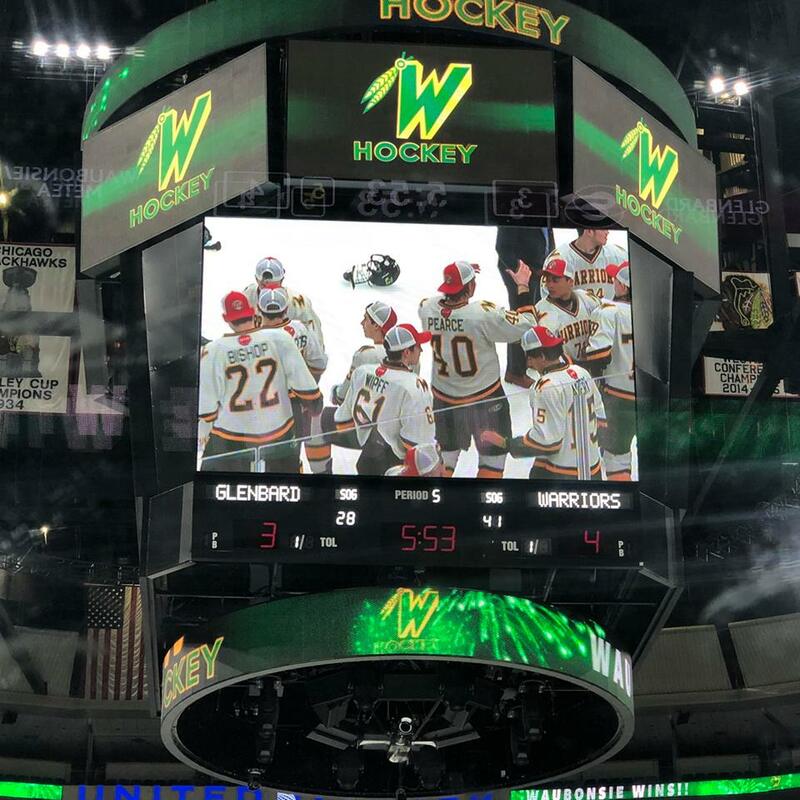 Waubonsie defeated Glenbard 4-3 in double overtime on March 22 at the United Center to claim the state title – and avenge last season’s loss at the UC. 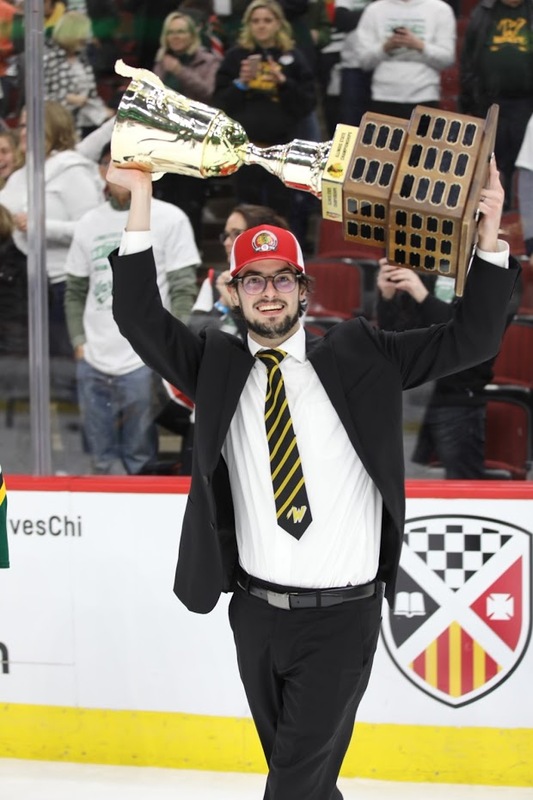 “When you win your 54th game of the season at the United Center, that’s a pretty cool experience,” Dombro said. “Overall, it was a great day, which included a (team) breakfast and a morning skate, (a team) dinner at a local country club, and then the team bus ride to the United Center. 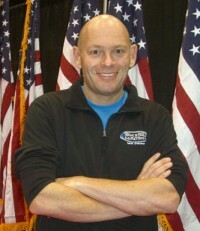 “It’s an extremely special experience, and everyone was lucky to be a part of it. “The win was a huge weight lifted off my shoulders, and also off the team’s (collective shoulders) after making it (to the finals) last year, but losing. Everyone’s goal was not just to make it there this year, but to win it. We put a lot of pressure on ourselves to get back there at times. Waubonsie lost to BG/H/W last season in the state championship game. This year it was perennial power Glenbard sitting, and skating, across from Waubonsie at the UC. Neither team struck in the first period, but Waubonsie opened a 3-1 lead after two periods. Glenbard tied the game, forcing OT. “I think we (had) a perfect amount of aggressive (play) in overtime. We knew we could take chances if we had them, but didn’t want to give up them,” Dombro said. Senior right wing Will Naffziger scored a rebound goal at 11:55 of the second period to give Waubonsie a 1-0 edge. Senior right wing Jason Sommers also scored a rebound goal, tallying at 7:02 of the second period to make it 2-0. Junior forward Sam Ruffolo finally converted a Glenbard breakaway, making it 2-1 at 6:45 of the second. Senior center Michael Alberts tallied at 3:24, pushing it to a 3-1 Waubonsie edge. Brett Quinn converted a turnover at 10:45 of the third, making it 3-2. Quinn wasn’t done with his heroics, as he scored a highlight reel, on-one-knee goal at 2:35 of the third. Waubonsie wouldn’t score the game-winning goal until 5:53 over double overtime, on the power play. “(Goalie) Justin Howard was phenomenal. He made some great saves early on and (they) helped us build momentum. We had a lot of trust in him, knowing that he was going to make the saves that he needed to,” Dombro said. Howard stopped three Glenbard breakaways in the first period alone. Dombro said that the support from Waubonsie Valley and Metea Valley High Schools, plus many in their local communities, have been surreal. He also has had support from co-workers, friends and family. Same can be said for the Waubonsie players. “When the boys got on the bus after the game, each of them had 30-plus Snapchats – from people at the game, the celebration, etc. That was pretty cool,” Dombro said. 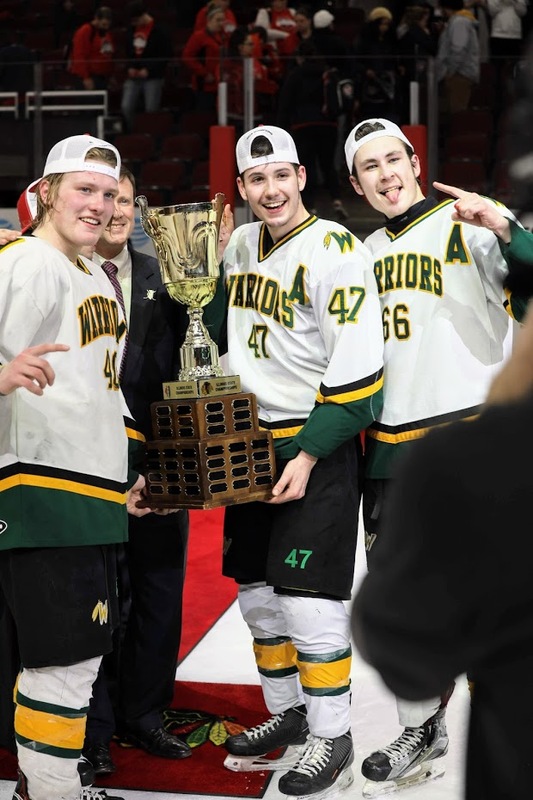 Junior defenseman Nolan Cummings was credited with the game-winning goal, giving Waubonsie its second state title in club history. Howard and Pearce will return, “and I think we can add a few pieces, and then should be able to repeat the success we had this season,” Dombro said. 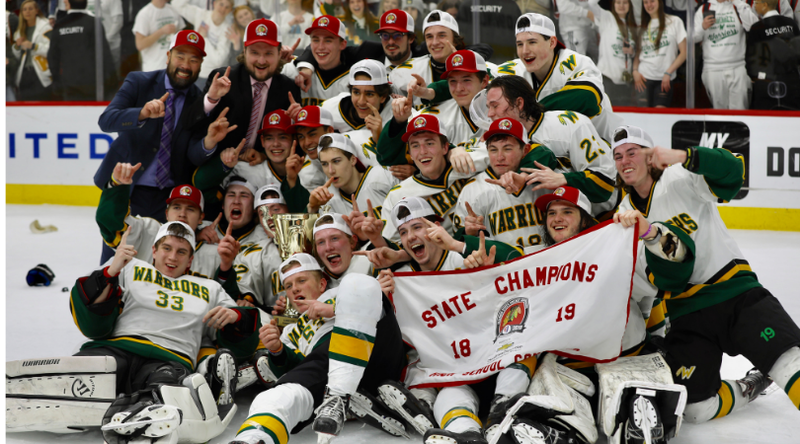 Waubonsie will play spring hockey in April and May, take June and July off, and then start the road back to the United Center in August.